Magazine Beach goes by many names. I’ve heard it called Rex beach, the Beach at Rex Grenadian, and Aquarium Beach. Whatever you choose to call it won’t not change the fact that it is one of the best of all Grenada Beaches, and one of my favorite. Go to Magazine Beach if you are looking for no disturbances, but still want to be close to the action. Depending on the day of the week, or time of day you get the feeling that Magazine Beach is all yours. 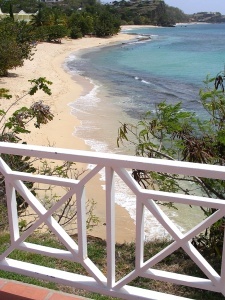 If you are a guest at the Rex Grenadian hotel this will probably be your default beach. If you are not a guest expect to share the beach with a few guests from this hotel and even fewer locals. Photography: Magazine Beach Grenada by mre1965. On the southern end of Magazine Beach is Aquarium Restaurant. That just solved all your food concerns. Aquarium is one of Grenada’s best Restaurants. They also have an endless supply of cocktails and cold Carib beers (local favorite) for the occasion, served from their nice beach bar. Just don’t go swimming if you had one too many. 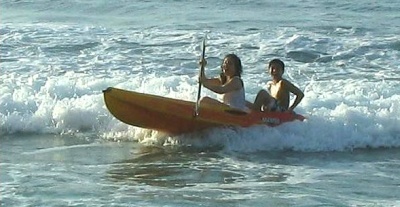 Catching a wave on a kayak and snorkeling the nearby reefs are two fun activities at Magazine Beach. Sunday is a spacial day and one of the best days to visit Magazine Beach; thats of course if you like Barbecue. The Aquarium restaurant puts on a beach barbecue and all are invited. Follow the Road towards the Airport, and continue until you arrive at Aquarium Restaurant. Or you can access the beach higher up via Rex Grenadian Hotel area. 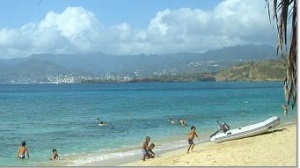 The Rex Grenadian Hotel occupies the northern section of Magazine Beach and is the closest hotel. La Source Hotel is also another nearby option; it is less than a mile away. Several other options exist within 3 – 5 miles of the beach, to see them browse our Grenada Hotel Accommodations directory.